The Digital Media Technology (DMT) Lab specialises in the development of methods for creating, processing, analysing, evaluating and distributing digital media. The Lab has four core themes and its academics, research fellows and PhD students bring together core expertise in digital signal processing and machine learning to collaborate on projects. 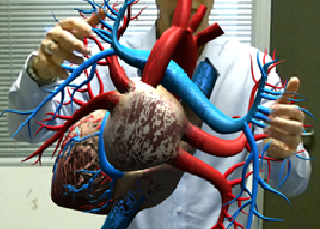 The Mixed Reality and Human Computer Interaction (HCI) Group researches a range of new and exciting applications in HCI, Mixed Reality (MR), Augmented Reality (AR) and Virtual Reality(VR). The group specialises in understanding and defining new methods and modes of interacting with computer systems via new sensor systems and current AR and VR hardware. The group also researches into the methods for improving the application and adoption of AR and VR systems into production workflows and holds a core specialism in understanding the usability and plausibility of the end systems. The group consists of a core team of academics who are part of national and international committees (ISMAR) and interest groups (ImmerseUK) in AR, VR and work with some of the world's leading international companies in developing novel AR and VR solutions. The group further works in conjunction with leading UK charity organisations in researching novel interfaces and hardware solutions for users with physical impairments. Creed, C. (2016) Assistive tools for disability arts: collaborative experiences in working with disabled artists and stakeholders, Journal of Assistive Technologies, 10, 2, p. 121-129. Creed, C. (2016) Eye Gaze Interaction for Supporting Creative Work with Disabled Artists. Proceedings of 30th British HCI Group Annual Conference (HCI2016), Bournemouth, UK. Al-Kalbani, M. Williams I and Frutos-Pascual, M. “Analysis of Medium Wrap Freehand Virtual Object Grasping in Exocentric Mixed Reality”, Mixed and Augmented Reality (ISMAR), 2016 IEEE International Symposium on, Merida, 2016. Creed, C., Beale, R., Cowan, B. (2015) The Impact of an Embodied Agent's Emotional Expressions Over Multiple Interactions, Interacting with Computers, 27, 2, p. 172-188. Hough, G.; Williams, I.; Athwal, C., "Fidelity and Plausibility of Bimanual Interaction in Mixed Reality," IEEE Transactions on Visualization and Computer Graphics, ,vol.12, no.99, pp. 1377-1389, 2015. G.Hough, I. Williams, C. Athwal. “Measurements of Live Actor Motion in Mixed Reality Interaction”. IEEE International Symposium on Mixed and Augmented Reality. Munich, Germany. 2014. G.Hough, I. Williams, C. Athwal. “Measurement of Perceptual Tolerance for Inconsistencies within Mixed Reality Scenes”. IEEE International Symposium on Mixed and Augmented Reality. Munich, Germany. 2014. Hough G, Athwal C and Williams I. Advanced Occlusion Handling for Virtual Studios. Lecture Notes in Computer Science, Springer 2012. The Digital Image and Video Processing group researches a range of new and exciting applications for analysing and processing still image and video data. The research within the group is directly linked to a wide variety of application domains, these include medical image analysis systems, security analysis systems, video post production systems and and image distribution systems. The group has a strong core specialism in the application of low-level image feature extraction, image object classification, image compositing and real-time video processing systems and has strong ties with the Mixed reality and HCI group. Unsupervised Superpixel-based Segmentation of Histopathological Images with Consensus Clustering. Fouad, S., Randell, D., Galton, A., Mehanna, H. & Landini, G. 19 Apr 2017. Medical Image Understanding and Analysis (MIUA) 2017. Communications in Computer and Information Science (CCIS) with Springer, p. 767- 779, 2017. Model-based Correction of Segmentation Errors in Digitised Histological Images. Randell, D., Galton, A., Fouad, S., Mehanna, H. & Landini, G. 19 Apr 2017. Medical Image Understanding and Analysis (MIUA) 2017. Communications in Computer and Information Science (CCIS) with Springer, p. 719-730, 2017. Dolhasz, A. Williams I and Frutos-Pascual, M. “Measuring Observer Response to Object-Scene Disparity in Composites”. Mixed and Augmented Reality (ISMAR), 2016 IEEE International Symposium on, Merida, 2016. Williams I, Svoboda D and Bowring N. A Novel Performance Metric for Greyscale Edge Detection. Proceedings of the International Conference on Computer Vision Theory and Applications 2010. Bowring N, Williams I, Johnson C and Jaiswal J. Fatigue crack, squat and wheel burn detection by a multi-scale statistical image processing technique. Proceedings of the 33rd Annual General Meeting of the British Institute of Non-Destructive Testing. Williams I, Svoboda D, Bowring N and Guest, E. Statistical Edge Detection of Concealed Weapons Using Artificial Neural Networks. Proceedings of SPIE-IS&T Electronic Imaging. Vol. 6812. Bellingham, Washington: SPIE, 2008. p. 68121J-1-12, 12 pp. ISSN 0277-786X. Williams I, Svoboda D, Bowring N, and Guest E. Improved Statistical Edge Detection Through Neural Networks. In 10th Conference on Medical Image Understanding and Analysis 2006. ISBN: 1-901727-31-9. P.56-60. The Digital Audio Processing Group is a multidisciplinary research group working in the areas of Music Informatics, Digital Signal Processing (DSP), and computational musicology. It studies technologies for analysing and processing music, using a range of Digital Signal Processing (DSP) techniques. This involves processing musical event data in real-time and the processing of digital audio signals. Our research extends to embrace psychoacoustics and music theory/analysis/synthesis subject areas. With a wealth of knowledge gained from working alongside industry and in collaboration with other institutions, we are ideally placed to engage in cutting-edge research work. As part of a Faculty with a long history of working alongside creative companies, we use innovative computational techniques to develop a range of outputs that can be employed by forward-thinking businesses. The Group is a vibrant hub for audio technology research. With close links to research teams in Digital Image and Video Processing as well as the Centre for Music and Performance at Birmingham Conservatoire, the research within this group is focused on using a range of scientific and mathematical techniques and draws on a strong emphasis on DSP. We have expanding opportunities for students wishing to pursue MPhil and PhD study. The Digital Media Distribution Group addresses a range of advanced topics in distribution formats and services. The group specifically focusses on applications in commercial media operation for network provision, authoring and composition of media and presentation of media services for consumption and re-use of media content. B. Veloso, J. Foss, B. Malheiro, J.C. Burguillo-Rial. “Improving On-line Genre-based Viewer Profiling” In Proceedings of the In-Programme Personalisation for Broadcast (IPP4B) Workshop, ACM TVX 2017 Conference, Hilversum, The Netherlands, June 2017 (TVX 2017), 6 pages. J. Foss, B.Shirley, B.Malheiro, S.Kepplinger, A.Ulisses, M.Armstrong, “In-Programme Personalisation for Broadcast: IPP4B (Workshop Summary)” In Proceedings of the In-Programme Personalisation for Broadcast (IPP4B) Workshop, ACM TVX 2017 Conference, Hilversum, The Netherlands, June 2017 (TVX 2017), 6 pages. B. Veloso, J. Foss, B. Malheiro, J.C. Burguillo-Rial. “Product Placement Platform for Personalised Advertising”. New European Media (NEM) Summit 2016. T.Ma, Y.Wang, et al. "Evaluation of Flexilink as Unified Real-Time Protocol for Industrial Networks" 13th IEEE Conference on Industrial Electronics and Applications (ICIEA 2018), To appear and paper accepted. R.Ma, Y.Wang et al. "Optimum Design of Multistage Half-band FIR Filter for Audio Conversion using a Simulated Annealing Algorithm" 13th IEEE Conference on Industrial Electronics and Applications (ICIEA 2018) To appear and paper accepted. X.Zhu, Y. Wang, W. Hu, et al. “Practical considerations on optimising multistage decimation and interpolation processes,” to appear. “IEEE International Conference on Digital Signal Processing”, Beijing, 2016 OCT 16-18. N.Jillings, Y.Wang, J.Reiss, R.Stables, "JSAP: A Plugin Standard for the Web Audio API with Intelligent Functionality". 141st Audio Engineering Convention, Los Angeles. 2016 09. W.Hu, Q.Shi, Y.Wang, et al. “An efficient task mapping algorithm with power-aware optimization for network on chip,” Journal of Systems Architecture, Elsevier, 24 April 2016, ISSN 1383-7621. O. Hawker and Y. Wang, “A Method of Equal Loudness Compensation for Uncalibrated Listening Systems,” in Audio Engineering Society Convention 139, 2015. I. Arnaldi, Y. Wang, "A SIMULINK toolbox of Sigma-Delta modulators for high resolution audio conversions", 137th AES Convention Los Angeles, 2014. N. Jillings, Y. Wang, "CUDA Accelerated Audio Digital Signal Processing for Real-Time Algorithms", 137th AES Convention Los Angeles, 2014. Y. Wang, J. Grant, and J. Foss, "Flexilink: A unified low latency network architecture for multichannel live audio", 133rd AES Convention San Francisco, Oct 2012. Y. Wang, J. D. Reiss, "Time domain performance of decimation filter architectures for high resolution sigma delta analogue to digital conversion", 132nd AES Convention, Budapest, Hungary, April 26–29, 2012. Y. Wang, X. Zhu, Q. Fu, "A Low Latency Multichannel Audio Processing Evaluation Platform", 132nd AES Convention, Budapest, Hungary, April 26–29, 2012. Y. Wang, Engineering Brief: "Latency Measurements of Audio Sigma Delta Analogue to Digital and Digital to Analogue Converts ", 131st AES Convention, New York, USA, Oct 20-23, 2011. Y. Wang, R. Stables, J. D. Reiss, "Audio Latency Measurement for Desktop Operating Systems with Onboard Soundcards", 128th AES Convention, London, May 22-25, 2010.